OPPO Digital has announced that the new UDP-205 4K Ultra HD Universal Blu-ray Disc Player is now available for purchase in New Zealand. This unit is a successor to the award-winning BDP-105 series of universal Blu-ray Disc players, and is a step-up version of the recently released UDP-203. 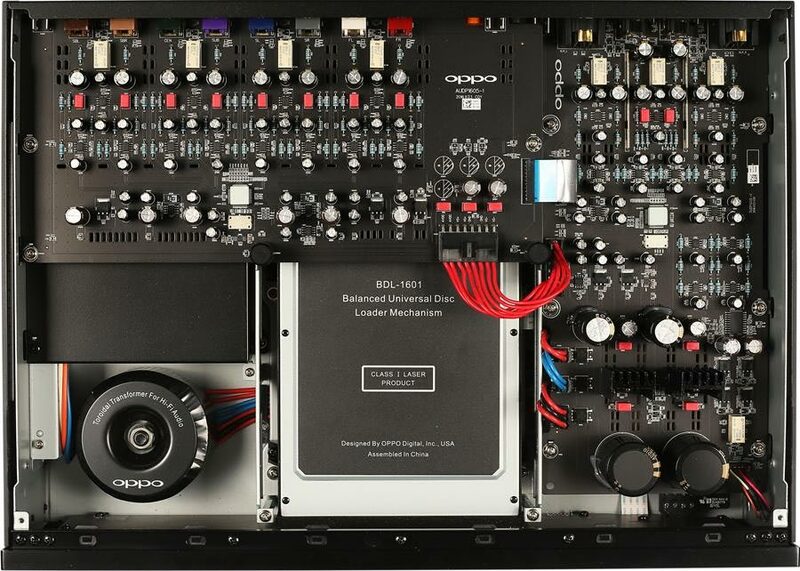 According to OPPO, the UDP-205 “brings top-of- the-line audio performance to a universal player that supports 4K Ultra HD Blu-ray and many other digital audio and video formats”. Playback of 4K Ultra HD Blu-ray, regular Blu-ray, Blu-ray 3D, DVD-Video, DVD-Audio, SACD, Audio CD and many other formats. High Dynamic Range (HDR10) and firmware upgradeable to Dolby Vision. Dual HDMI outputs – HDMI 2.0 for UHD and HDMI 1.4 for audio. An HDMI 2.0 input port for external streaming devices or set-top boxes. The audio performance of the OPPO UDP-205 is claimed to be a significant upgrade over the UDP-203 and previous generation OPPO players. The UDP-205 provides reference level sound quality through the analogue outputs, improves the clock precision of the HDMI audio output, and increases the power of the built-in headphone amplifier. For the analogue output stages, the UDP-205 utilises two ES9038PRO DACs, which are the flagship of the ESS Sabre Pro series. Stereo listening accounts for a large part of audiophile usage of a universal player, so the UDP-205 offers a dedicated stereo output in addition to its 7.1-channel analog audio output. The stereo audio output is powered by a dedicated ES9038PRO DAC chip and specially designed buffer and driver stages. It provides both XLR balanced and RCA single-ended connectors. The balanced output features a true differential signal path all the way from the DAC to the 3-pin XLR connector. By transmitting a pair of differential signals, the balanced output provides better common-mode noise rejection and improves signal quality. Headphones can be connected directly to the UDP-205’s built-in headphone amplifier. The headphone amplifier is connected directly to the ESS SABRE PRO DAC and offers a unique performance advantage over standalone headphone amplifiers. Compared to the built-in headphone amplifier in the previous generation OPPO BDP-105/105D players, the new design offers more power and higher performance. In addition to its playback capabilities, the UDP-205 adds a USB DAC, a coaxial and an optical digital audio input so users can take advantage of the excellent audio performance of the UDP-205 with other sources. The asynchronous USB DAC input supports sample rates up to 768 kHz PCM and DSD 512. By bypassing the low fidelity, poor quality DAC of traditional computer sound cards, the UDP-205 turns any computer into a high performing multi-media source by utilising the ES9038PRO DAC. For additional convenience and flexibility, the UDP-205 can also convert digital signals from cable and satellite boxes, televisions, video game consoles and other digital transports with coaxial and optical digital outputs to analog. The UDP-205 features a high-stability, high-precision HDMI clock and a special HDMI audio jitter reduction circuit. This unique design significantly reduces jitter and eliminates timing errors, allowing for increased accuracy with the audio-only HDMI output port. PCM and DSD signals rely on the HDMI clock directly, so the HDMI audio jitter reduction circuitry can improve the sound quality of PCM and DSD audio. For compressed bitstream audio, it helps to ensure error-free transmission, and may improve the audio performance depending on whether the audio decoder in the A/V processor or receiver uses a synchronous or asynchronous clock scheme. The UDP-205’s audio circuitry is powered by an oversized toroidal power supply. Four heavy-gauge machined feet provide a stable foundation for the UDP-205, and isolate it from outside vibration. A new double-layered chassis further enhances the rigidness and vibration-canceling capabilities. The internal layout and chassis design promote healthy airflow so critical components can be naturally cooled. Strategically placed heatsinks and ventilation grilles allow the UDP-205 to run both cool and quiet without the need for internal or external fans.